Common Monkeyflower is a member of the Snapdragon or Figwort Family. The plant grows to 3 feet in height and has dark green, oval leaves with toothed edges that grow on opposite sides of the stem to 4 inches in length. The plant typically grows in wet areas along streams or near springs at elevations between 500 - 9500 feet. 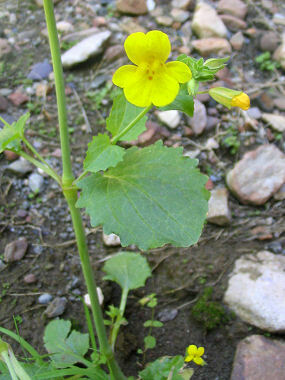 Native Americans used the leaves of the Common Monkeyflower for salad greens. Common Monkeyflower blooms between March - September and produces a bright yellow flower with red spots in the throat and two upper pointing lobes and three that point downward. Flowers typically grow to 1.5 inches in length and 1.25 inches in width.